"A clarifying, Sulfate-free shampoo that removes product build-up, while infusing hair with moisture. Leaves hair soft and shiny. Gentle enough to use every day. Promotes growth by nourishing and strengthening damaged or chemically processed hair, reducing the appearance of breakage and shedding. Apple Cider Vinegar aids in regulating and balancing pH levels on the scalp, while softening hair to promote enhanced growth." "Water (Aqua), Decyl Glucoside, Sodium Lauroyl Lactylate, Glycerin, Hydrolyzed Rice Protein, Panthenol, Hydrolyzed Vegetable Protein PG-Propyl Silanetriol, Guar Hydroxypropyltrimonium Chloride, Butyrospermum Parkii (Shea) Butter*, Fragrance (Essential Oil Blend), Ricinus Communis (Castor) Seed Oil, Mauritia Flexuosa Fruit Oil, Tocopherol, Aloe Barbadensis Leaf Juice*, Vinegar, Acetyl Tetrapeptide-3, Niacin, Dextran, Trifolium Pratense (Clover) Flower Extract, Caprylhydroxamic Acid, Caprylyl Glycol, Butylene Glycol, Caramel, Mentha Piperita (Peppermint) Leaf Extract *Certified Organic Ingredient*"
"Apply to wet hair, gently massage from root to ends. Rinse Thoroughly. Repeat if necessary." I've been using the SheaMoisture Jamaican Black Castor Oil Strengthen, Grow & Restore Shampoo for a little while now. I bought it during a B2G1 sale and use it for clarifying my relaxed hair. What drew me to it was the ingredients. Particularly the Jamaican black castor oil and apple cider vinegar. I use those two products separately and was excited to be able to use them together in a shampoo. The shampoo is a dark color which is probably from the castor oil. I really like the smell which is a nice scent of vanilla. Whenever I use it my hair and scalp feel cleansed, but not stripped. in fact, I think this clarifying shampoo is the only one I've used that leaves moisture in my hair and gives it shine. 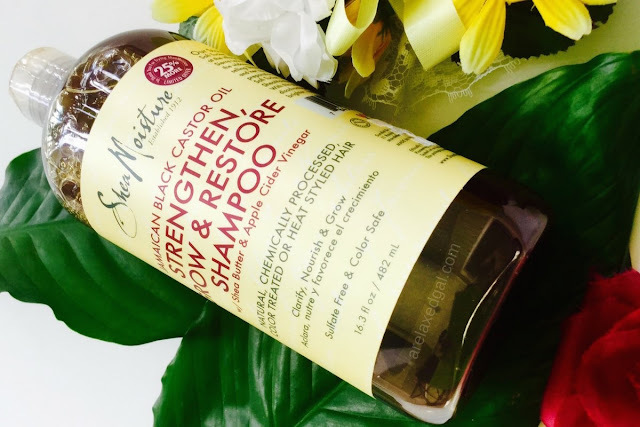 The SheaMoisture Jamaican Black Castor Oil Strengthen, Grow & Restore Shampoo is a keeper. I love the benefits of the black castor oil and apple cider vinegar. 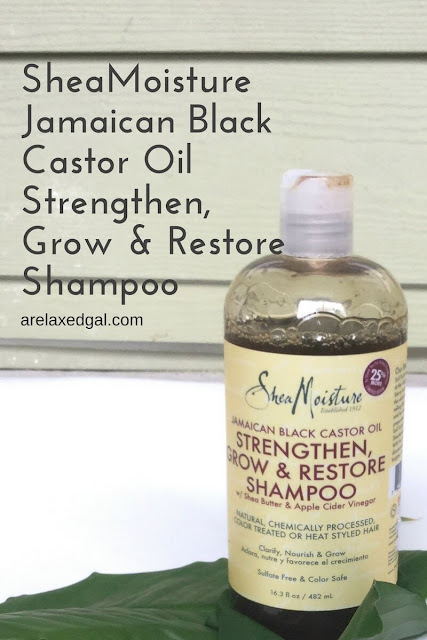 I think I might like this better than SheaMoisture's African Black Soap Cleansing Shampoo and will replace it as my go to clarifying shampoo. I loved this shampoo cause it made my hair feel clean but my hair shedding something kinda crazy and the masque is really thick. I want too try it again but i am so scared of the shedding. I used the masque and afterwards my hair felt so soft and strong,but not for aure if it is 2 much protein???? It could be protein or maybe it's the castor oil. I've heard it makes some people shed the first few times they use it.